There are so many incredible things to do in Munich Germany, that after 4 full days exploring this beautiful city, my feet barely functioned. 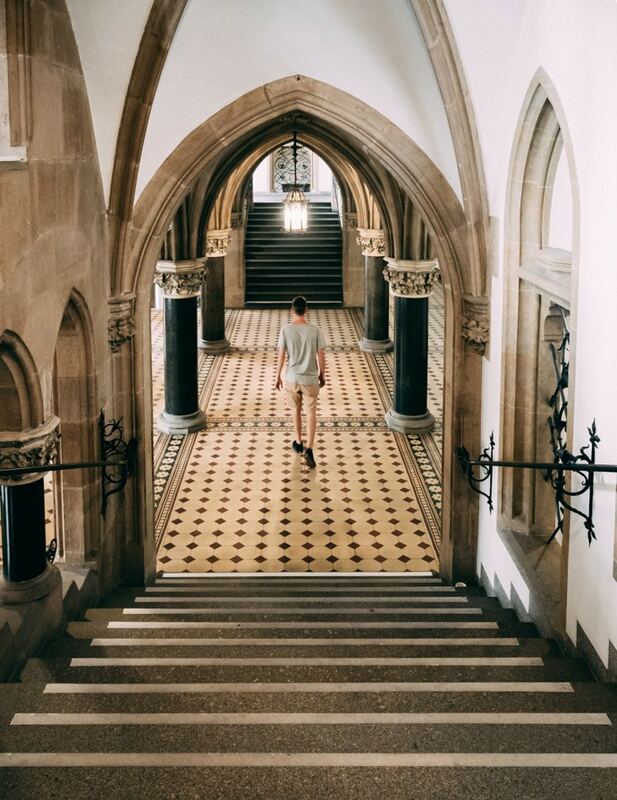 Not only are there so many amazing things to do in Munich itself, but it also works as a good base to explore the equally as beautiful surrounding areas. 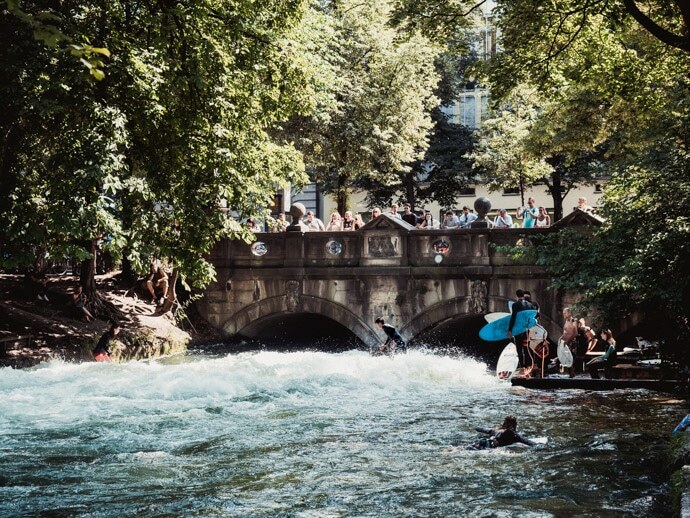 From exploring Munich Old Town to relaxing in beer gardens to surfing in parks, here are our favourite picks of things to do in Munich Germany. 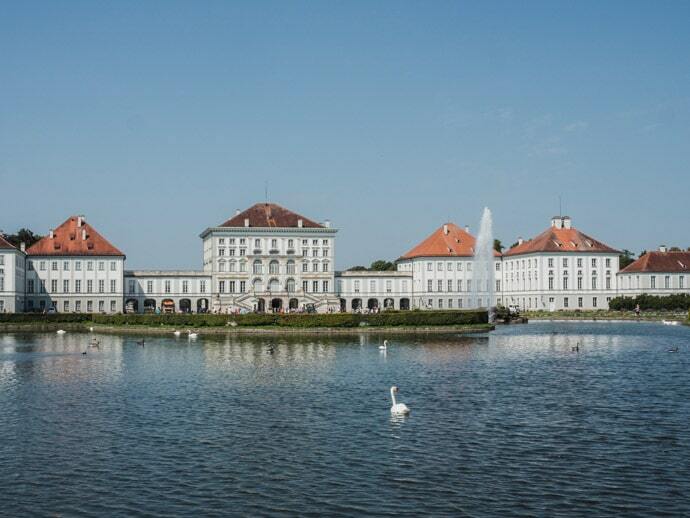 Nymphenburg Palace was originally built as a summer home to Bavarian Electors and Kings. 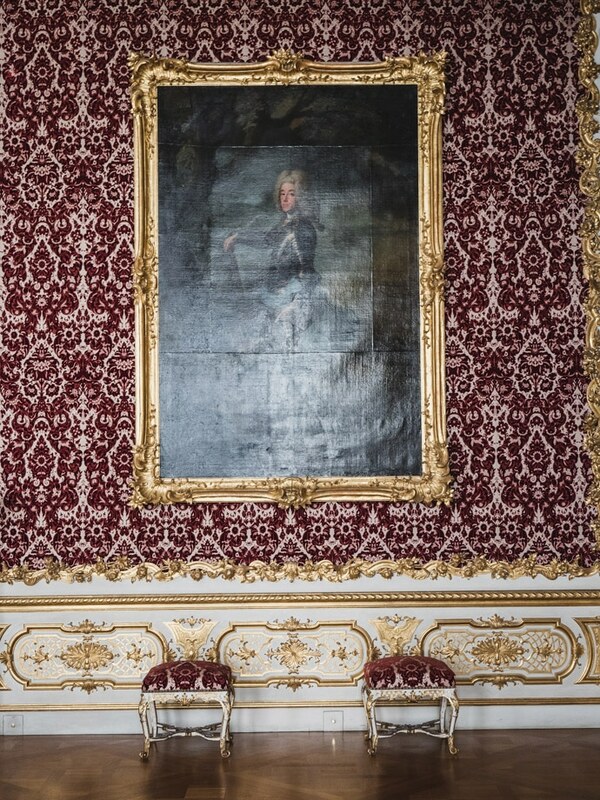 Here you can explore the Palace, the park palaces, the park itself, and the carriages and sleighs museum. There’s so much to see and do, we spent half a day here. It was one of our favourite things to do in Munich. 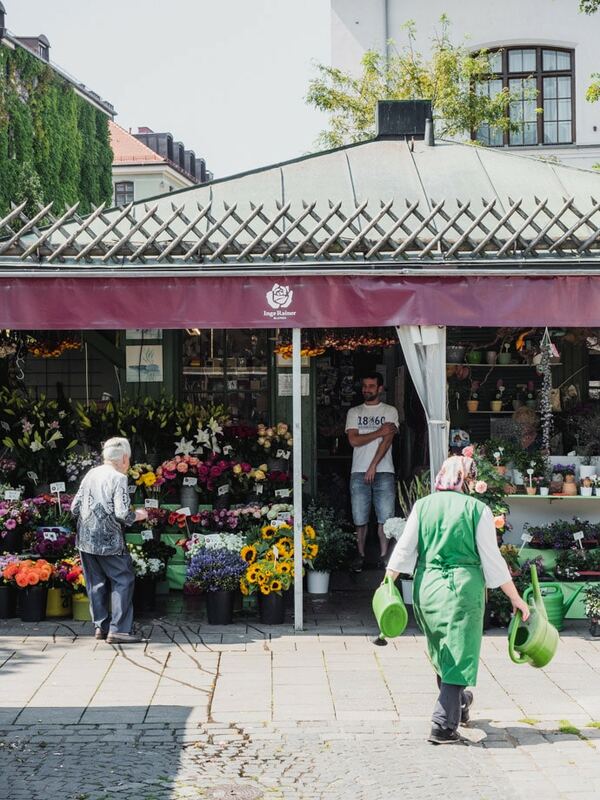 Even though it’s not right in the city center, it only takes about 15 minutes by public transport to reach and is a great addition to your Munich itinerary. The Munich Residence is the former royal palace and served as the seat of government and residence of the Bavarian dukes, electors and kings from 1508 to 1918. Here you can choose a ticket for the Munich Residence, the treasury, and the Cuvilliés theatre. We chose to just do the Munich Residence as we arrived later in the day and had less time and because it’s the one that interested us the most. You will need a couple of hours to walk through all of the rooms, and you follow a loop-like path. 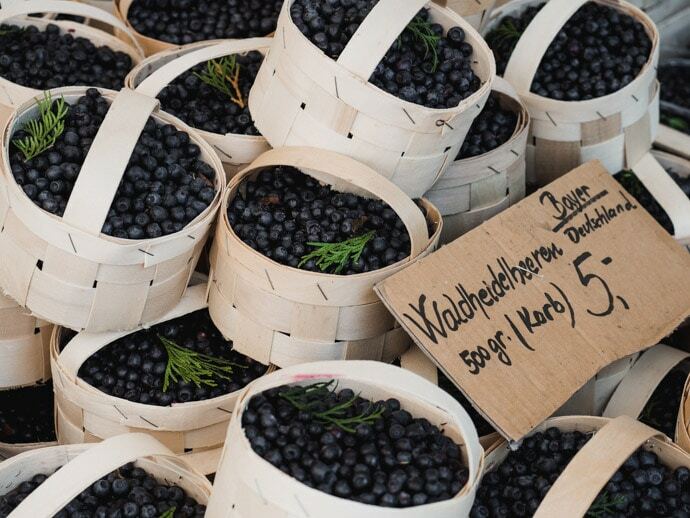 Viktualenmarkt is a fabulous market bordering Munich Old Town. 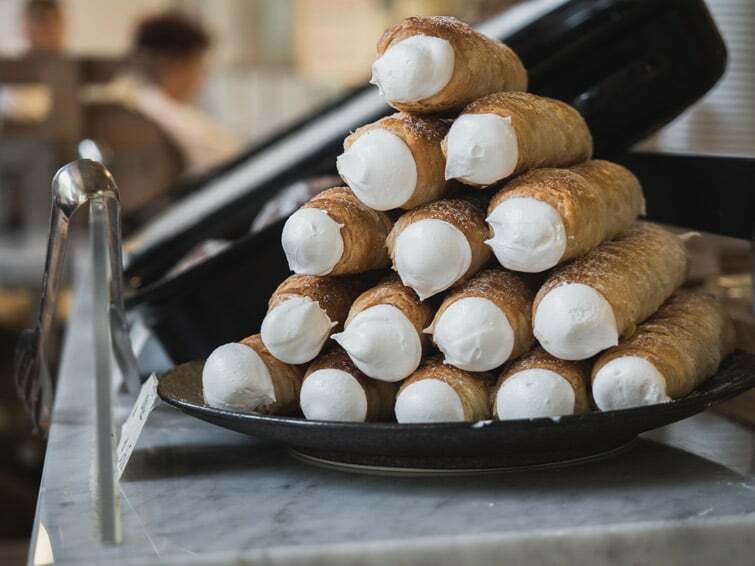 Here you can find over 140 stalls of fresh fruits and vegetables, loose leaf teas, places to eat, a beer garden, cafes, and other specialty stores. We loved the Chai Latte from Kaffeerösterei Viktualienmarkt. If you’re staying in an Airbnb, then this is the perfect place for you to visit to get all your cooking supplies. Viktualenmarkt is closed on Sundays. 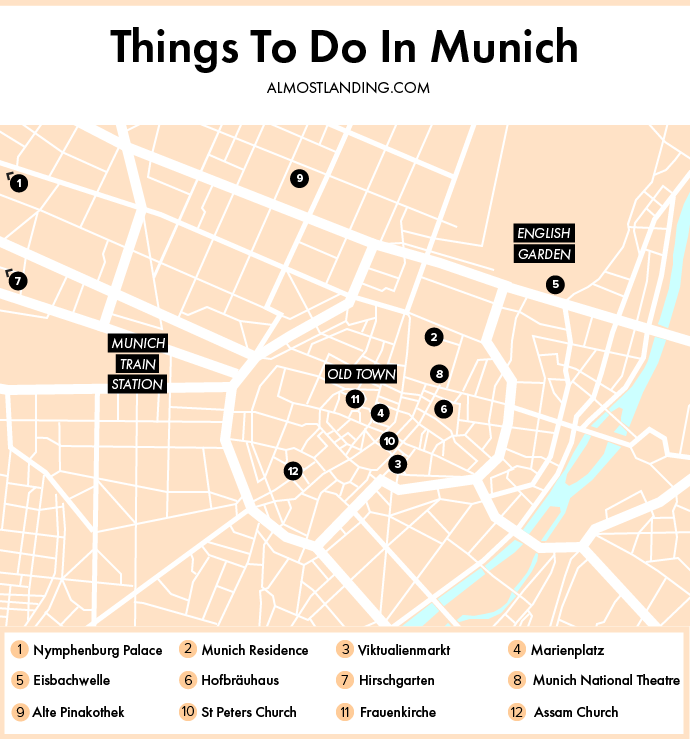 One of the first places to visit in Munich will most likely be Munich Old Town and Marienplatz square. Here is where you will find the Glockenspiel, New City Hall (Neues Rathaus) and Old City Hall. Although you can see the Glockenspiel dance at 11 am, noon and 5 pm, in our opinion, it’s not worth scheduling in, more if you happen to be nearby. You can also walk through the New City Hall and admire the architecture. Marienplatz is also the sight of Munich Christmas markets. 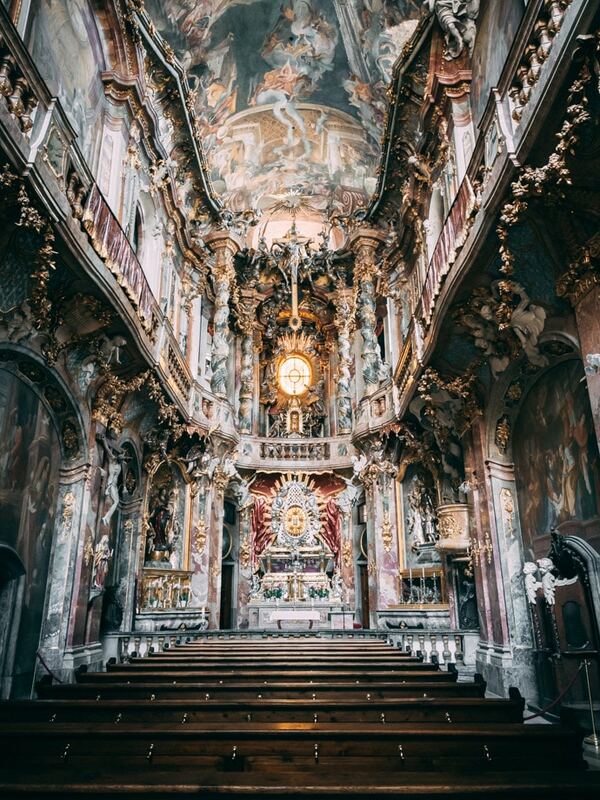 There are some beautiful historic churches to visit in Munich. St Peters Church and Alter (where you can get a great view over the Old Town), Frauenkirche Church, St Michaels Church, Theatine Church and Assam Church. 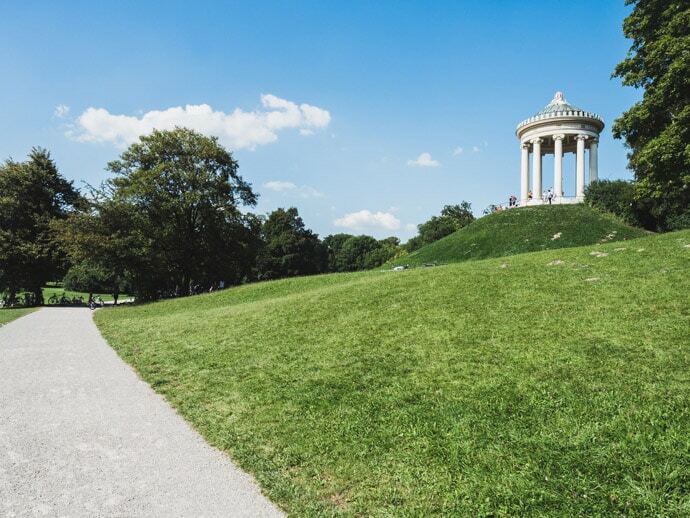 The beautiful English Garden (Englischer Garten) is a huge park with areas of sprawling green grass, beautiful canals and trees. This is where you will find what feels like most of Munich in the summer. It’s full of people relaxing, eating, surfing, and floating down rivers. One of the best sights (besides the surfing) is the Monopteros. Oh and also the people floating down the river in the summer. If you’re interested, make sure to bring your swimmers. 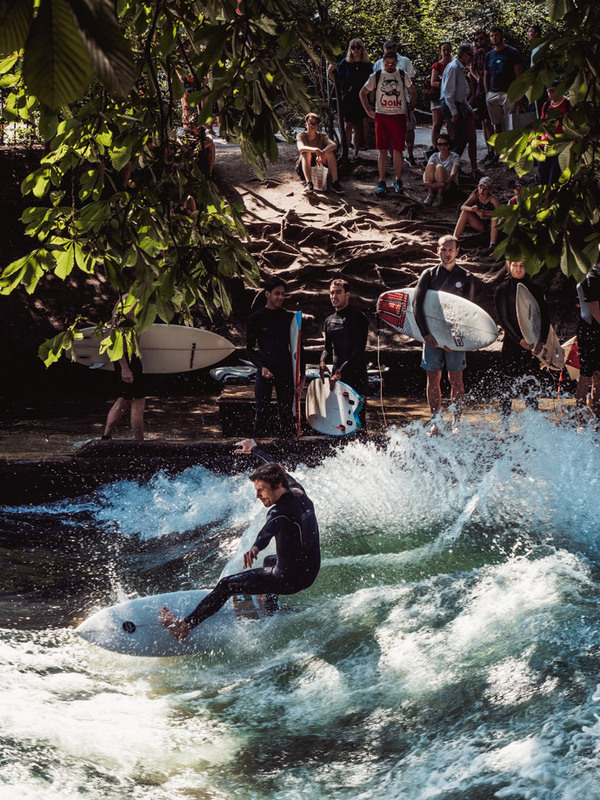 If there’s one thing you need to see when you come to the English Garden, it’s the people surfing in the canal at Eisbachwelle. Surfers jump into the river onto the wave on their board and you can seriously stand here and watch it for a long time. And as they still continue into the colder months, it’s one of the best things to do in Munich in winter too. You can find this near the Prinzregentenstraße road. Munich is famous for its beer halls and beer gardens. Even when it’s not Oktoberfest, you can still enjoy these fabulous venues. Hofbräuhaus, although the most touristy of them all, is still worth visiting for the ambience. We preferred the beer hall inside over the beer garden outside, as it seemed to have more character. 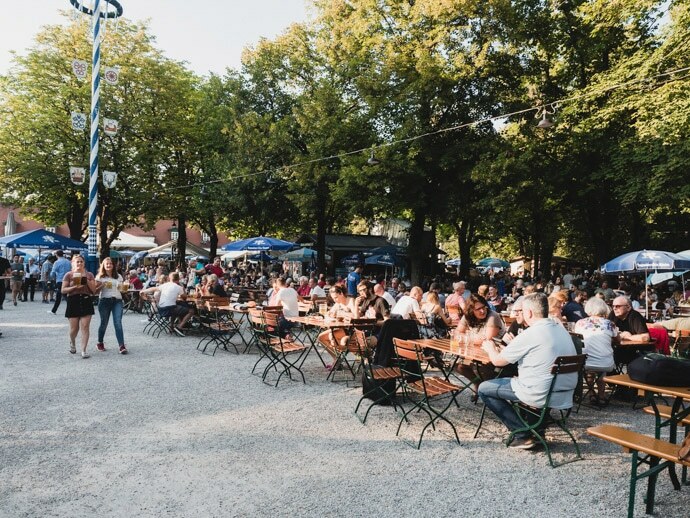 But for a more authentic local experience, try Hirschgarten, the largest beer garden in Munich. It’s located in a beautiful park and is the best beer garden to visit in the summer. It’s in the Nymphenburg neighbourhood, and full of locals of all age ranges, families, couples, groups of friends. Share a table and order some food, a giant pretzel and beer. You can also wander around the park. 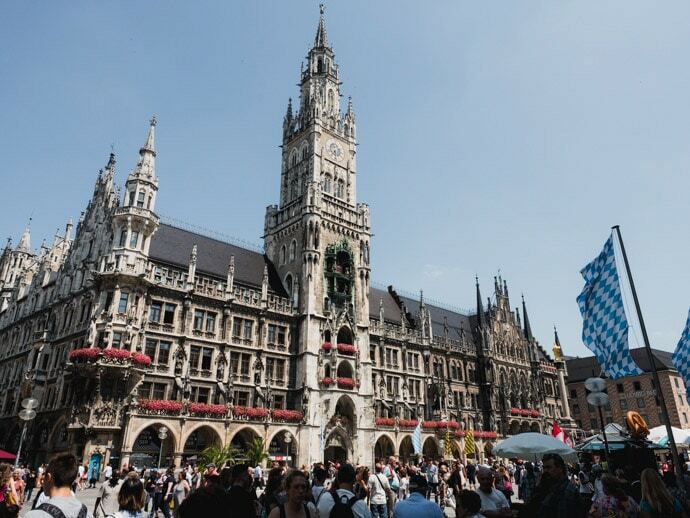 If there’s one thing that comes to mind when you think of Munich, it’s probably Ocktoberfest, whose history dates back to 1810. This famous beer festival, that actually starts in September and runs for 2 weeks (3 weekends), is a popular reason to visit Munich. So if you’re after that extra ambience and festivities, and mainly want to experience the beer halls of Munich, then Oktoberfest is a great time to come. 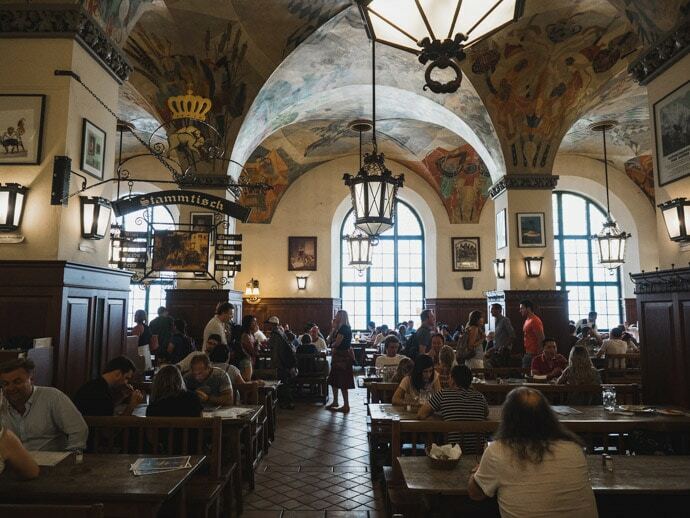 If you’re happy to visit the beer halls at any time of the year, then pick another time to visit Munich, as prices will rise during Oktoberfest. If there’s one thing you need to know about food in Munich is that the serving sizes at traditional restaurants are big. Really big. So come prepared and you might struggle to have three meals a day. 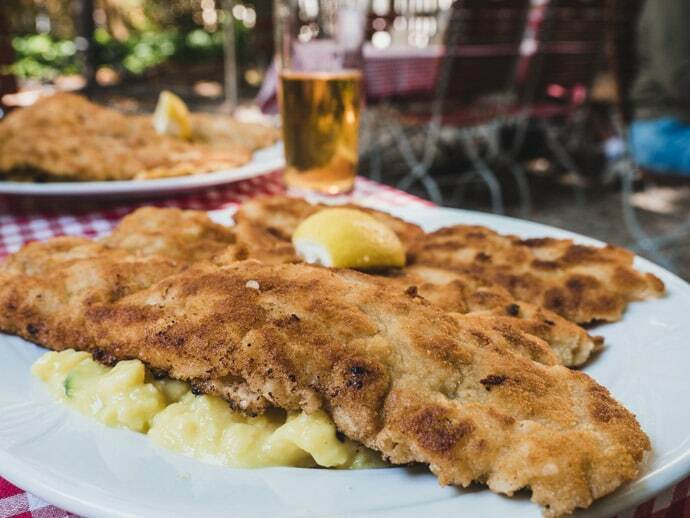 But when in Munich, you have to try the traditional dishes, some of which are Pretzels, Schnitzel, Weisswurst (white sausage), Schweinshaxe (roasted pork knuckle), Sauerkraut, Knödel (potato or bread dumpling), Apfelstrudel, Kaiserschmarrn (shredded pancakes). 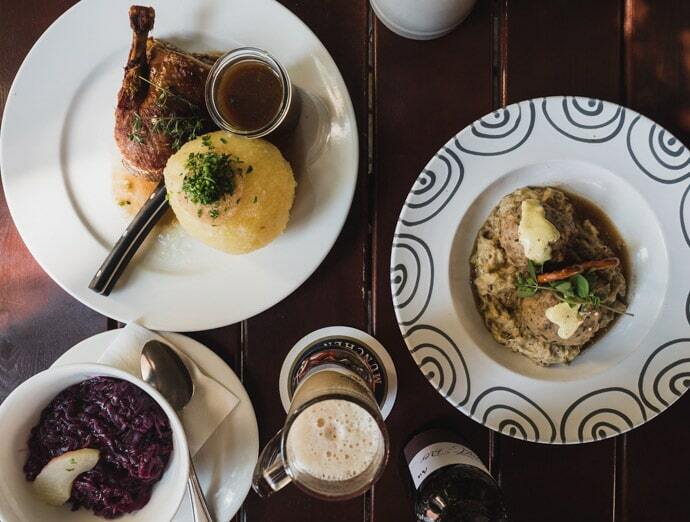 One of our favourite restaurants was Wirtshaus in der Au. We stayed at an Airbnb in Munich, and our host was telling us about how Munich has one of the best operas in the world. So if you have the time and it interests you, perhaps look up what’s showing before your trip and book some tickets at The Munich National Theatre. 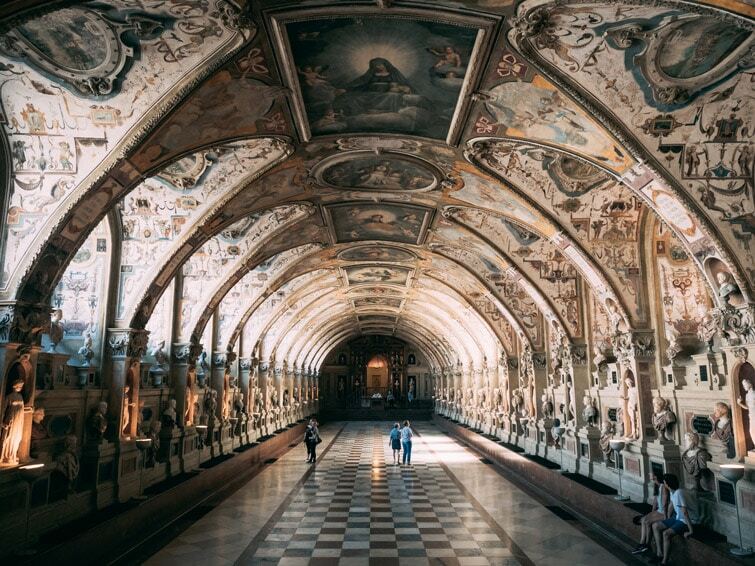 If you love museums and art galleries, then you will enjoy the many options in Munich. Alte Pinakothek is one of the worlds oldest art galleries. Neue Pinakothek, Pinakothek der Moderne, the Lenbachaus are also art galleries worth a visit. 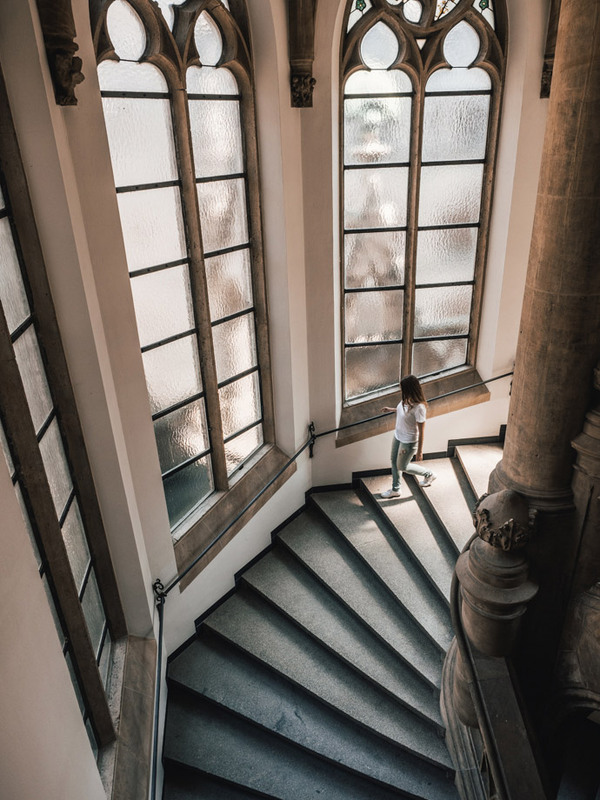 You are also spoilt for choice with museums such as The Deutsches Museum of science and technology, the Bavarian National Museum, BMW museum and BMW Welt and the Glyptothek museum. There are plenty of day trips from Munich that you can do if you have the time. 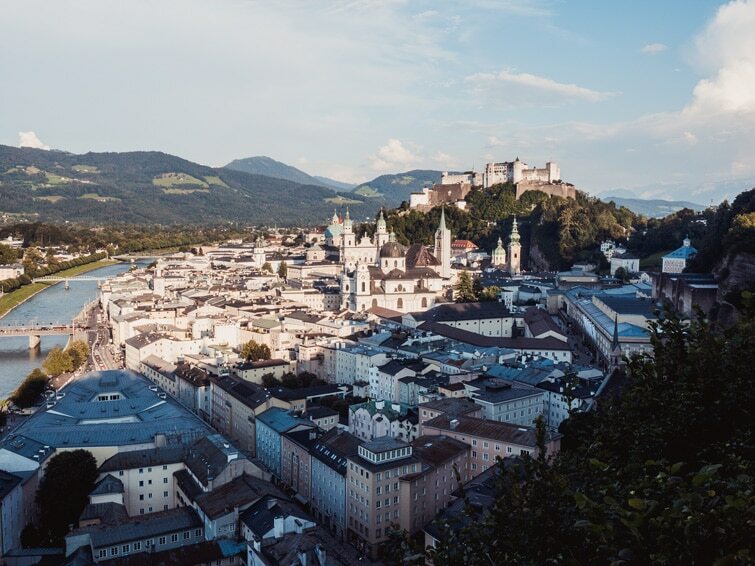 From Munich, you can visit Salzburg, Neuschwanstein Castle, Dachau concentration camp, Rothenburg ob der Tauber, Berchtesgaden and many more places. For more information on Munich see Munich Tourism Board.